Littlestone Golf Club has thrown open its doors to a brand new Pro Shop located by the main clubhouse overlooking the championship links, regarding by many as one of England’s finest courses. The new modern structure will allow the club to stock a much more extensive range of golf equipment, clothing including a members’ branded range, shoes and golf accessories which can now also be bought online. A brand new SAM PuttLab, the world’s leading putt coaching and training system, has also been installed for members and visitors alike who will be able to undergo a complete analysis of their putting and then make use of training modules to rectify any weaknesses in their stroke. For many years the Pro Shop at Littlestone, which runs two memberships, The Championship Links and The Warren, was situated at The Warren, the club’s second course. With The Championship Links membership and visitor numbers rising steadily over the last few years, the old premises was no longer fit for purpose as it was not able to fully service the increasing needs of main club. So, with The Warren Pro Shop also in need of serious repair, a temporary home was found in the main clubhouse. Plans were then put forward for a completely new home for the Pro Shop by the main clubhouse. Once the site and design had been agreed, the club approached LEADER and the Rural Payments Agency in East Kent for help to fund the project. Fortuitously the Kent Downs and Marshes LEADER Programme reverted that it would assist with a grant aiding a new reception and Pro Shop. “This is an ambitious project which will deliver jobs and growth to the Romney Marsh area and will attract additional visitors to the area,” commented Andrew Sinclair, Programme Officer for the Kent Downs and Marshes LEADER Programme. “The LEADER Programme’s support for this project was crucial and made the build possible so we are extremely grateful for their support,” said Sarah Saunders, Sales, Membership & Marketing Manager at Littlestone. To coincide with the opening of the new shop, Littlestone has already employed a new PGA trainee so the club now has four golf professionals as well as a receptionist to handle the overall running of the new outlet. 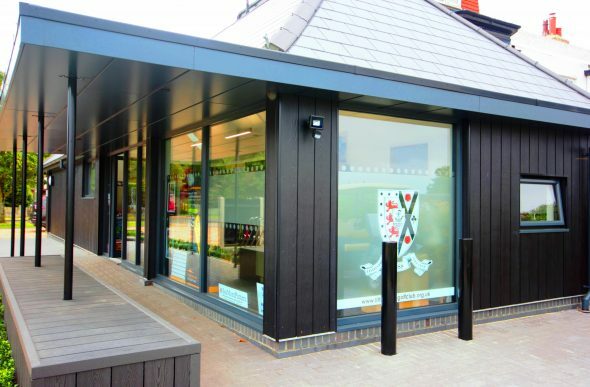 The Pro Shop is very much seen as the flagship for future plans to create a Centre for Excellence Academy catering for golfers of all levels and ages. In addition to the prestige of staging of The Junior Open in 2020, Littlestone will benefit from the hosting of The Open Championship at nearby Royal St George’s in the same year, attracting attention from around the world and no doubt more visitors looking to experience this revered championship links and benefit from the establishment of a new Pro Shop. Littlestone and Royal St George’s are part of one of the finest stretches of championship links in England together with Royal Cinque Ports, host of The Open in 1909 and 1920 and Prince’s which staged The Open in 1932. Littlestone itself is laid out on a stretch of land between the famous Romney Marsh and the English Channel where the sand dunes form natural, undulating ground ideal for links. The unique microclimate that exists on this part of the coast makes it one of the driest places in Britain and results in firm terrain that produces hard and fast fairways that are beautifully defined by the natural dunes, so typical of links golf. Together with the thick, wild rough and classic deep pot bunkers, the course demands accurate ball striking, well thought-out course management and speed control on the greens, making it a challenging test of golf. For more on Littlestone, visit www.littlestonegolfclub.org.uk or call +44 (0)1797 363355.